In large bowl, mix 2 tablespoons of the melted butter, 1/4 teaspoon of the salt and 1/4 teaspoon of the pepper. Add potatoes and cauliflower; toss to coat. Place cauliflower and potatoes (skin sides down) in single layer in pan. Roast 16 to 18 minutes or until just tender when pierced with knife. Remove from oven; stir. In same large bowl, mix remaining 2 tablespoons melted butter, 1/2 teaspoon salt and 1/4 teaspoon pepper. Add chicken to mixture; toss to coat. Arrange in single layer in pan next to vegetables. 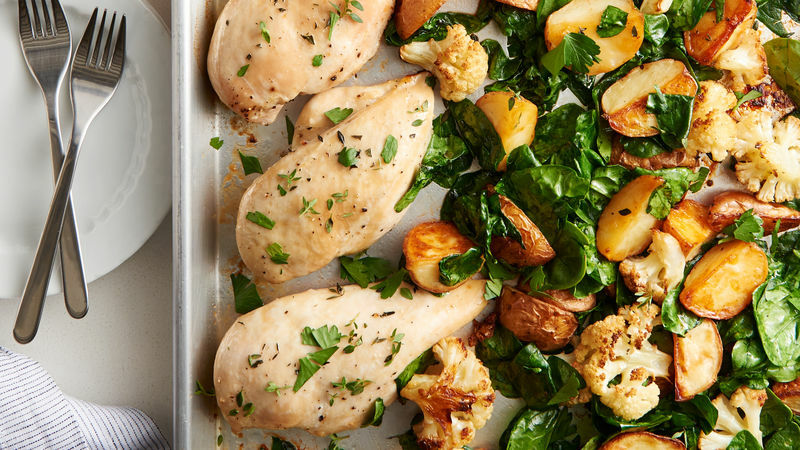 Roast 20 to 25 minutes longer or until juice of chicken is clear when center of thickest part is cut (at least 165°F) and potatoes and cauliflower are browned and very tender. Add spinach to pan. Roast 1 to 2 minutes longer or until spinach wilts slightly. Top with remaining herbs. Save prep time by purchasing bagged precut cauliflower florets. Vegetables should be about the same size to cook evenly. Cut potatoes in sixths if large; halve or don’t cut at all if small.